Featured in the Racine Journal Times. 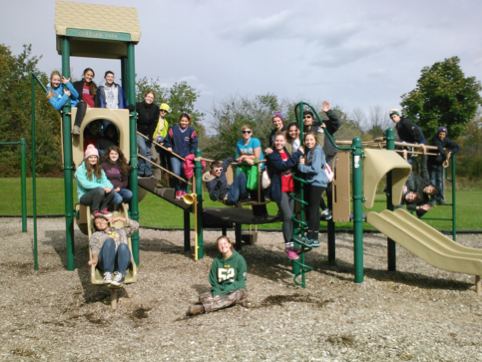 Twenty-two members of The Prairie School’s Wilderness & Sustainability Club spent several hours in Cliffside Park in Racine County on Sunday afternoon, October 5, learning firsthand about the need to protect the environment, picking up litter, and beautifying the area. The school officially adopted the park several years ago in a county program and the student-led Club has been helping local officials take care of Cliffside ever since. It is all part of Prairie’s experiential approach to learning. Sunday’s park cleanup also helped to build and enhance the Prairie students’ social consciousness in at least two critical ways. First, the learning went beyond environmentalism to become sociological as well. After finding a partially-hidden tent that was evidently the shelter of a homeless person, the kids discussed the situation and the plight of the homeless, then picked up the various items and possessions scattered about and put them inside the tent to be safe from rain. Second, the students’ muddy boots at the end of the day helped them to learn that one has to be the change one desires to see in the world. Each student came to realize that litter begets litter – i.e., people feel free to be sloppy if they see garbage and debris lying around, but are less likely to disregard the environment in an area that is clean, tidy, and respectfully maintained. 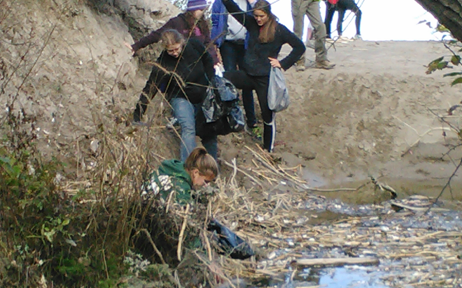 Due to Prairie’s Wilderness & Sustainability Club’s efforts, visitors to Cliffside Park’s beaches, trails, and play equipment will notice the autumn leaves, rocky creeks, sandy beaches, and pastoral surroundings — (temporarily) untarnished by human waste. This entry was posted in Featured, Learn More About Prairie, Sustainability, Upper School by Communications Department. Bookmark the permalink.